Japanese Ingredients ＞ Japanese Mustard ＞ What is Japanese mustard? When one thinks of mustard, Japanese mustard does perhaps not come to mind, but oh what a mustard it is. Japanese mustard is slightly different to “regular” mustards like American mustard which is made from a mixture of spices, vinegar and most importantly mustard seeds. Japanese mustard is just a mixture of mustard powder and water making it, like many Japanese foods, simple but refined and elegant and by far the best mustard to combine with Japanese dishes. First of all, let me give you a little background on the genre of mustard. All mustard seeds are harvested from a plant called the mustard plant. This plant is in the same family as cabbages, Brussel sprouts and broccoli. The family of mustard plants is certainly extensive with around 40 different types of mustard plants on earth today! For cooking though, there are three main ones used, white mustard seeds, black mustard seeds and brown mustard seeds. White mustard seeds are what are used when making a mild mustard, something that might go well on the side to compliment taste and not overpower it. Black mustard seeds are at the opposite end of the scale, these seeds are used to make the really sharp and peppery mustards that have a big bite. Brown mustard seeds are positioned on a spiciness scale somewhere between white and black. Different types of mustards use a combination of these different seeds or just one type. On today’s market, there are a huge number of mustards available; they are usually, powdered, prepared yellow mustard and whole grain mustard. Japanese ones come in three kinds, Karashi, wasabi and komatsuna. These three varieties are used in very different ways but each of them have very robust properties and can really bring a dish to life with their addition. Karashi mustard is a household item in Japan, and can be easily found in supermarkets, online shopping sites and just about anywhere that sells food. Given its versatility in use and delightful flavor, it is viewed in Japan as a “must have” item and for this reason you’d be hard pressed to find a home without it! So what is Karashi you ask? Karashi is the Japanese equivalent of American mustard, it looks a very similar yellowish colour but tastes slightly different. It is extremely versatile and can be used as a spread on sandwiches through to a dipping sauce for deep fried tonkatsu. It is made from dried brown mustard seeds and has quite a distinctive vinegary taste that is quite pungent. It is generally sold in a paste form but can also be bought in a powder form. There are actually two separate types of karashi, wagarashi and yoogarashi. Firstly, wagarashi is white or brown and has a really strong and vinegary taste, this might be used in sandwiches or in many savory Japanese dishes also as it brings a great depth of taste to a meal. Secondly, yoogarashi is the milder of the two types and is used when a strong tasting mustard would be too overpowering. It is made by mixing water with the powder form to make a paste. There are so many uses for karashi and with a little bit of imagination, it can be applied to many dishes to offer exceptional flavours and improvement. 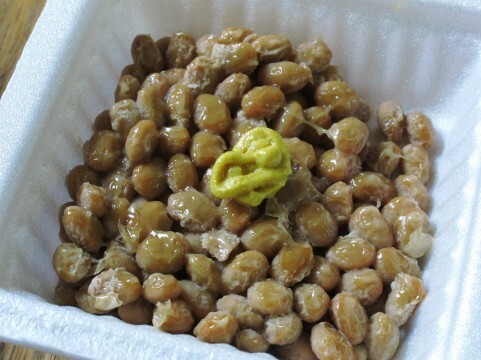 Japanese people often combine it with a little tsuyu sauce and mix in with natto (fermented soy beans) to give a little bit to the flavor of the soy beans, this is a true classic in Japan and in fact, nearly all natto packets come with the karashi included! Another use is as a dipping sauce, the famous Japanese dish, tonkatsu (deep fried crumbed pork) is usually served with a large helping of Japanese mustard on the side for adding a little spice to the dish, many other deep fried foods and even vegetables goes well with karashi when dipped into it. Another key use is combining it with miso soup and vinegar to create a dish called karashisumiso, a miso soup with a nice tang to it. The uses really are limitless given its versatility, once you try it and get a taste of it, you’ll be able to combine it easily with your favourite foods too. The second type of mustard is wasabi. Just like Karashi it has a kick but in the case of wasabi the kick is a lot bigger! Wasabi is a Japanese plant or root vegetable (it is known in English as Japanese Horseradish) with a thick green root which tastes like strong horseradish and is used in cookery, especially in powder or paste forms as an accompaniment to raw fish. The wasabi plant is a member of the Brassicaceae family (which also includes cabbages, horseradish and mustard). The root of the Wasabi plant is used as a condiment and has an extremely strong flavour. Its hotness is more like a hot mustard - the vapours tend to stimulate the nasal passages more than they do the tongue, so whilst you might not feel a burning sensation or experience a numb tongue it will certainly help you to clear any sinuses. Because the burning sensation of wasabi is not oil based it is only a short burning sensation compared to that of a chilli, the burning sensation will go away after a short time and it is recommended you eat and drink as normal which will assist in the alleviation of the burning. It is very important to remember that less is always more when it comes to Wasabi; the more you have the more painful the burn is going to be. Wasabi is a very delicate plant; it requires certain climate conditions, lovely cool temperature and a mountain stream. It takes about a year and a half to harvest. Wasabi plants also grow little flowers on them, these bloom around the beginning of spring. This flower is also edible and pickled generally in soy sauce. The last type of mustard is Komatsuna. Komatsuna is probably not as widely discussed or known as it’s brothers wasabi and Karashi but in Japan it’s widely used and enjoyed. This mustard is actually a leaf and not a seed and for this reason it is used quite differently. It comes from the same family as turnips and cabbages and is grown throughout Japan. They are dark green in colour and look a little like spinach leaves (the taste is far from it of course). Popular with the older generation in Japan, komatsuna is often used in soups and broths, being very high in calcium, it offers a lot of important nutrition as well as an elegant taste. Komatsuna leaves are also sometimes ripped off and combined with lettuce leaves in salads. Combining it with tofu, soy sauce and very finely cut chilli is one example of a side dish I once enjoyed with it. Komatsuna is also often pickled and boiled with other foods too. It’s easy to find in supermarkets in Japan, especially in spring and autumn which are the best seasons for growing it. So there we have it, three types of Japanese mustard, each with their own very unique flavors and usage. If you’ve never tried karashi, wasabi or komatsuna, I strongly encourage you to get down to your local Japanese eatery or Japanese supermarket and have a go! How to use Japanese Mustard?